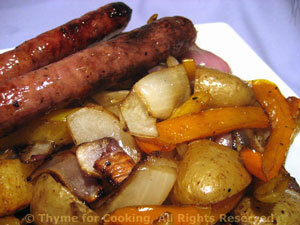 Sausages, Peppers, Onions, Potatoes, from Thyme for Cooking's seasonal menus. Bratwurst, Italian sausages, whatever your favorite, grilled, are perfect summer food. And, as long as you're grilling, do the rest of the dinner, too. A simple summer dinner, done completely on the grill. Use your favorite sausage: pork, chicken, turkey, duck... with or without added flavoring (apples, olives, herbs). Slice pepper (cut in half from bottom toward stem, discard seed and core) and onion (either vertically or horizontally - tastes the same and, in my humble opinion, looks the same after cooking). Cut the potato into bite-size pieces. Put olive oil, chili powder and Worcestershire sauce in large bowl, add all vegetables and toss well to coat. Cook over medium heat 20 - 30 minutes, until vegetables have a nice color and potatoes are done. About 10 minutes into vegetable cooking time put the sausages on the grill (allow more time if they are fat). Grill until done. Whichever gets done first just move to the side off of the main heat and finish up. OR: Put potatoes, onions and peppers onto a baking sheet with a lip (my trusty 'pizza' pan) and roast in 400F (200C) oven for 30 minutes. You can either add sausages after 10 minutes or sauté sausages in large nonstick skillet, browning well on all sides, then cover and continue cooking until done 4 - 8 minutes longer, depending on size (cut one open and look - shouldn't be pink). OR: Sauté potatoes, onions and peppers and do the sausages on the grill ....enough with the options, you get the picture.